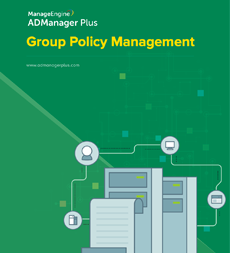 Windows Active Directory Group Policy Management using ADManager Plus. Group Policy in Active Directory (AD) helps IT administrators quickly manage AD users, computers, and groups. Traditionally, administrators had to rely on Group Policy management tools such as the Group Policy Management Console (GPMC) and Active Directory Users and Computers (ADUC) for Active Directory and group policy management. Managing Group Policy using just the native AD group policy management tools and PowerShell can be mundane and time-consuming. ADManager Plus is web-based Active Directory management and reporting tool that helps manage Group Policy Objects (GPOs) for multiple domains in just a few clicks. It also provides pre-built GPO reports that swiftly fetch GPO-related information. Create Group Policy Objects and also link them to multiple OUs, domains, sites at once in a single action drastically minimizing the time and effort required to perform the same tasks using native Active Directory Group Policy editor like the Group Policy Management Console (GPMC). ADManager Plus allows you to link appropriate GPOs to relevant containers whenever needed. You can also copy existing GPO links of domains or sites while creating new GPO links. Select multiple GPOs and GPO links from any node and perform following Group policy management actions instantly. Identify the administrative templates settings of user and computer configuration associated to the respective Group Policy Objects using the quick search and edit GPO settings in Active Directory. You can enable or disable GPOs completely or partially, that is, either the user or computer configuration settings alone. Using this feature, you can select multiple GPO links and enable or disable them instantly. This enables the administrator to control application of the GPOs in tune with the organization's policy changes. With ADManager Plus, you can enforce GPOs to easily enforce specific settings over others. You can also un enforce the GPOs whenever needed. By default, Group Policy settings are inherited from their parent objects. However, based on your need, you can choose the required container and block inheritance. You can also unblock inheritance whenever needed. Based on your needs, delete GPOs and remove unwanted GPO links in bulk. Clean up GPOs with the help of pre-defined GPO reports which makes it easy to identify the unused and disabled GPOs and delete them in bulk. ADManager Plus offers a set of pre-packaged reports such as recently created GPOs, GPO blocked inheritance containers, and more which makes it easy to obtain GPO related information instantly. Download ADManager Plus for free to test out all these features yourself. A quick guide to easily manage GPOs and GPO links.